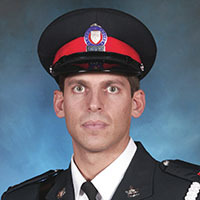 On November 30, 2013, Constable John Zivcic was working as a Traffic enforcement officer in 22 Division, where he had been stationed since joining the Service more than six years earlier. He was responding to an emergency call for an impaired driver with his lights and sirens on when he was involved in a collision at the intersection of Bloor St. W. and Neilson Dr. He was taken to hospital with life-threatening injuries. The driver of the second vehicle, a woman, was treated in hospital for non-life-threatening injuries. Zivcic later succumbed to his injuries at St. Michael�s Hospital on Dec. 2, surrounded by his family as officers stood vigil at the hospital.